Later this month Bono will be honoured as the first 'Man of the Year' at Glamour Magazine's annual 'Women of the Year' awards. The award recognises Bono's leadership, through ONE and RED, in campaigning for the rights of women and girls in the fight against global poverty - in particular ONE's #PovertyisSexist campaign. Cindi Leive, editor-in-chief of Glamour, said, "The idea that a man who could select any cause in the world to call his own, or no cause at all, is choosing to work, and not just for one night or at a special event, but consistently — day after day and month after month — on behalf of women is incredibly cool and absolutely deserves applause." "As an activist," said Melinda Gates, "He's using those skills to get the world talking about the fact that ending extreme poverty begins with empowering women and girls." 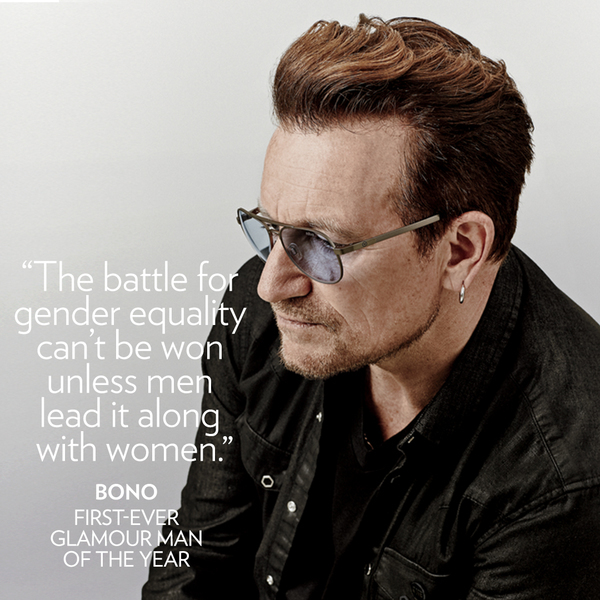 Bono told Glamour he was grateful for the award because it's a chance to say that men have to get involved in the campaign for gender equality. "We're largely responsible for the problem, so we have to be involved in the solutions. "We can do much more than we think we can. Leaders are accountable to all of us. If they don't support women and girls, vote them out of office. To quote Nelson Mandela, 'It always seems impossible—until it's done.' "
The 2016 Women of the Year winners who will be honoured at the November 14 Los Angeles ceremony are Olympic gymnast Simone Biles; Black Lives Matter founders Patrisse Cullors, Alicia Garza, and Opal Tometi; Stanford sexual assault survivor Emily Doe; model and body activist Ashley Graham; International Monetary Fund Managing Director and Lifetime Achievement winner Christine Lagarde; anti-ISIS activist Nadia Murad; designer Miuccia Prada; singer and style icon Gwen Stefani; and actress and activist Zendaya. Here's why CNN's Christiane Amanpour believes 'Bono is the perfect choice for this first-time honor'. My husband joined me in class action against the police service that discriminated against me and forced me out for being a woman. He was inspired by you and we hope more men can 'get with the program'. See you in Toronto for our music therapy session. We hope to hear Walk On or One. Please and thank you. Bono, your wise words, and gift of song have always touched my heart since I was a young girl growing up in upstate NY in a small town with small minded people, living through the loss of a parent (my Dad) at age 10, struggling to find a place to belong and get through what I understood to be the cruelty of life with a little hope, peace, love, and imagination. :-) Now I understand, peace is and has always been right here, I don't need to look for it "out there"--in other words, I don't need to be "running to stand still". Rebooting oneself is "not a hill, it's a mountain" for sure, and I deeply understand that a "heart that is broken is a heart that is open". Thank you so much for being my hero, and for inspiring my life (as well as many others) in countless ways through your beautiful heart, humanity, poetry and gift of song. "Stand up all ye people, stand up.."
I would agree,Your a good man, Your mother would be proud. A first off many firsts. Very we deserved and loved the speech. Keep on, keep on. You have so much to say and we are listening. Powerful voice, yet soothing. See you in June in Chicago, hopefully in front again. Do they know it's Christmas time at all. You are an amazing human being Bono! Thanks for being a voice for those who need help. Bono congratulations for this! You are THE BEST! Congratulations! you truly deserve this and much more! You as an artist , rock icon Sure use your voice for the Better! Congratulations Bono. You and President Barack Obama are true, male feminists. We need more leaders to think like you. Congratulations Bono! I have been a fan since I was a teenager in the 80's. I think about the early years and the causes you supported like Live Aid and Amnesty International. We need more Bono's to make this world a better place. You are an amazing humanitarian! Open your world, be honest and carry each other. Love and Light my way. .. ... .... To VertiGo or not Go! Congratulations. You go Bono. We need more men like you!!!! Thank you Bono for continuing this fight! It is extremely important for us all! We are all human! Why is that so hard for some people to understand? Regardless of race, gender, religion, nationality,...we are all the same in our humanity! Thank you! A well deserved award, great to see Bono getting recognition for being caring and compassionate in all he continues to be involved in. Congrats on being named Woman of the Year Bona - it is well deserved! I cannot emphasize enough how crucial it is that one of your favorite ever frontman continues on his way, childishly proud! that is not new in case of B. though but always refreshing. Thank you for the important work and activism you do, it is heartwarming. When you rise or if you fall I will follow!! The bSquirrel!!! Thank you, Bono, for all of your efforts to make the world a better place. Thanks to the entire band as well. Long may all of you continue! Não era de esperar outra coisa senao o reconhecimento dos valores inquestionáveis de Bono, mas sobretudo da banda. Já foi tudo dito sobre a sua vida dentro e fora da banda.